Stella finds her first truffles! 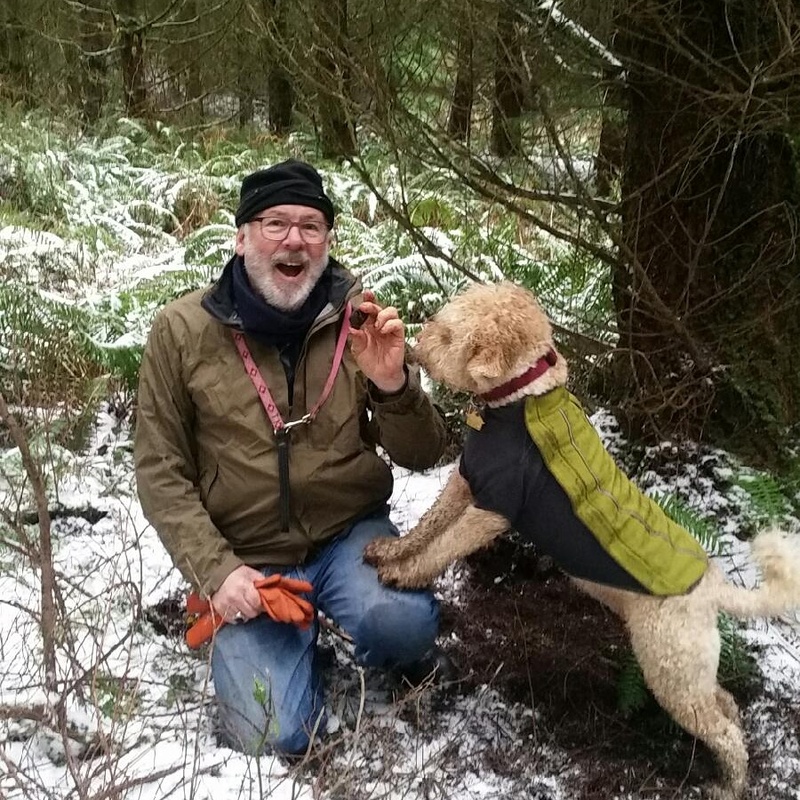 Stella finally found her first truffles in the wild, unaided by me, all thanks to Alana McGee, owner of Truffle Dog Company. Tomorrow we go out again, and again and again, because truffle hunting is a team sport. 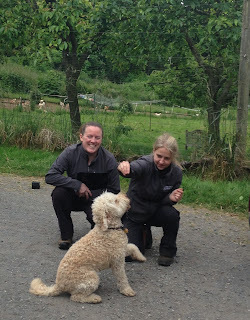 My job is to encourage Stella, to know when she is telling me where the truffle is, and to be able to find it myself. They are hard to see in the forest duff, and meanwhile Stella is off looking for another one as I sift through the dirt. Did I ever tell you the story of how I got Stella? I was in Port Townsend, feeling sorry for myself because I was lonesome on the farm, and my friend Michele suggested getting a dog. I had never had a dog, being very allergic to them, but I was willing to try. About that time a pair of beautiful curly dogs came walking down the sidewalk right in front of us. "Those look like Portugese Water dogs", Michele said, "and they are hypoallergenic!" We stopped the owners and soon found out they were Lagotto Romagnolos, even more hypoallergenic. I asked if I could bury my face in their fur. This I did for a few minutes, with no reaction. Patti Fischer and her husband Leonard were very obliging, and said they had just gotten the female and were thinking of breeding her with their intact male. I gave them my card, and said if they decided to breed them, I would like to buy one. Three months later they called me from their home in Sequim and let me know I was third in line for a pup. In August, when the puppies were 6 weeks old, I was asked to come to Sequim to choose one. I had been trying out Italian names all summer, and settled on Fabrizio if it were a boy, from the movie 3 Coins in a Fountain, where Jean Peters, astride a Vespa, waves her hand as she zooms off, saying "Arrivedella Fabrizio!" If a girl, Stella, for the wonderful character in Tennessee Williams' "A Streetcar Named Desire". Once there, two pups out of the litter of six held my attention. Both apricot colored, the boy was the breeders' choice for me, but the girl wanted me. I could not make up my mind, but had to, since all of the puppies were sold and needed to be chosen. We decided to stay in Sequim for the night, in case I wanted to come back in the morning. I said I would sleep on it, and know by then. At the hotel, after dinner, it was 9 o'clock when I turned on the tv. It was tuned to PBS, it was Saturday night, and it took me a minute or two to realize that the film playing was "A Streetcar Named Desire". Whoa, must be a sign!. I had not seen that movie in 20 years. Suddenly the nighttime downtown scene of flashing neon lights filled the screen, and there, at the top, was the word "Riley's", in big, flashing lights. I picked up the phone and called the Fischers. Stella was my dog. Raquel Ruiz Diaz, Chef Blaine Wetzel's longtime partner, is lending her considerable hospitality skills to Nettles Farm. As my duties at Lummi Island Wild Co-op increase, I see the need for a steady hand and watchful eye at the B&B, so that the quality of the experience stays strong. Raquel, who was badly injured in Paraguay a year ago last Valentine's Day, is continuing her complete recovery. While she cannot yet resume the long hours on the floor at the Willows Inn, she is super capable of taking care of the small but important details at Nettles, as well as organizing future workshops and other events. It has been my pleasure to work with her since 2010, and the past few weeks have been a reminder of how much she has to offer. My work at Lummi Island Wild Co-op has increased several fold as we move into buying halibut and spot prawns, as well as Fraser River salmon, from the Lummi tribal fishers. We marketed the halibut as Salish Sea Halibut, since I have known for many years how much better the flavor and texture of this halibut over Alaska or other Pacific halibut. Its diet is spot prawns and dungeness crab, and it is reflected in the bluish translucence of the flesh, as well as the gigantic flavor. Here are some pictures from the last few weeks. We have developed a new online store for our Lummi Island Wild products, including the halibut from early this month. Check it out at http://www.lummiislandwild.com/shop/. Stella is very very close to finding truffles in the field. She can locate 100% of the buried truffle hides now. The next step is to take her out on a truffle field workshop, to translate that skill into the real world. It's more for me than for her. We planted more than 100 blueberry bushes near the raspberries, and black currants as well. With the amazing spring we are having, pollination is super high, and I expect plenty of berries, Asian pears, and apricots, as well as kiwis this season. Remember, they are yours to pick when you come at the right time! Stella and Kitty, last year, and this year. Best friends forever. We are going to be raising our rates in the next few months, as we see how things will shake out with Raquel and other farm staff. If you have plans to come this year, book now and your rate will remain the same. The founders and owners of The Truffle Dog Company, Alana McGee and Kristin Rosenbach, visited Nettles Farm last weekend. The purpose was to see if, even in the drought we have had all May, we could find some truffles on and near the farm. They brought out their trusty dogs, a Lagotto and an Australian Shepherd, and off we went. Several areas were likely spots, but we found them in only two. 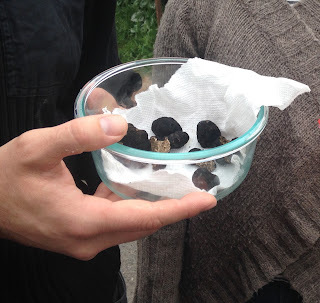 Altogether we found 3 truffles, a minor miracle given the dry soils everywhere we looked. Now we are taking the online truffle class that they offer with earnest desire and a solid goal: Stella will become like her ancestors of 600 years ago, a truffle hunter! The work I have been doing with Poulet Bleu and chicken workshops received some recent press: The Wall Street Journal just after Christmas, and The Huffington Post two weeks later. I got a puppy in September, a Lagotto Romagnolo named Stella (the truffle Smella), named for the character in A Streetcar Named Desire. STELLLL-A!!! We are training each other in the art of being and having a dog.....neither one of us has been here before.... and the learning curve is steep. I enrolled her in a truffle hunting class, which we are just beginning. I went truffling with a fellow named "Animal", a forager with a Lagotto named Austin. We found $100 of good black and white truffles (he had a drug truffle scale, $20/gram) over an hour of trudging through underbrush in the pouring rain, in a public forest near Issaquah. The drive back home was infused with the warm, comforting aroma of truffles, so pleasant I was surprised by the experience.This quickly inspired me to get serious with Stella. The goats have found a new home. Rosy was going after Stella. Nico was going after all children, lately with more purpose. They are together on a hobby farm in the county. I miss them and so does the feral cat that, unbeknownst to me, was living with them on the sly. I have been feeding the cat for the past year and a half, hoping to make friends with it (you can see I was lonely...I hate cats), and it would show up unexpectedly and I would put the food bowl closer and closer to my back deck. It was so skittish that if I looked its way it would bolt. Finally, the cat, whom I named Cosette from Les Miserables, because she was definitely a survivor, allowed herself to eat from the bowl on the deck. When I rehomed the goats, Cosette started showing up more and more, and I would see her in the goat pen wandering. She spent a lot of time with the chickens, too, and I finally realized that she had been spending all of her time on the farm, with the animals. When I got Stella, Cosette could not get enough of her. Over a few months Cosette, who turns out to be a boy (he must have been just a kitten when I first fed him), continued to engage Stella and to be passive and inviting. The result is that they are best friends, and all without a single word being spoken! I hope you find the time to come for a restful stay sometime soon! We'll all be waiting. The Saone River in Burgundy divides the region into two distinct geographical areas. To the west, the rolling hills of the Grande Cru wine country, where Montrachet, Puligny, and Mersault burgundies are created by God and man. 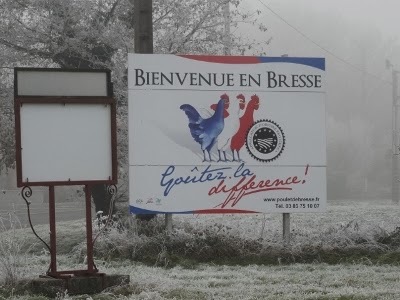 To the east, the flat farmy plain of the Bresse AOC, home of the poulet de Bresse. 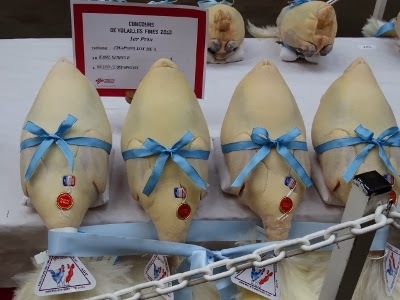 Every mid-December since 1862, this region has celebrated the noble chicken that defines French character in silhouettes, images, and sculptures thoughout France. 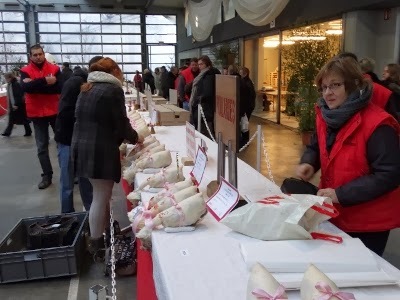 The festival, held in Bourg-en-Bresse, is called Les Glorieuses, and is the focal point of the holiday buying season for restaurants and individuals alike. In the week before the festival, all of the area farmers can be found processing and wrapping capons, hens, and other poultry in anticipation of their busiest sales season. Below the owner of a small farm is working with 3 or 4 of his helpers, doing the "roulage" on his capons, sewing a tight cover over the carcass to keep the fat nice and even. The head, feathered neck, intestines, and everything else, is still in the bird. 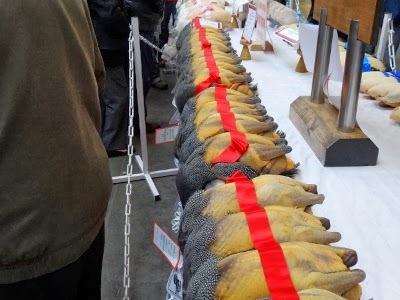 In this manner, the chickens can be aged for up to 21 days, and when a chef prepares the bird for the New Year's feast, the flavor is very good. A farmer sews the roulage over his capon. The judging for the chickens is about consistency in size, skin color and fat. The best birds are sold to the highest bidder, and by the end of the day, all of the birds have found homes in (mostly) restaurant kitchens. 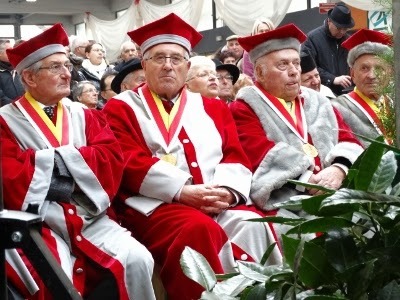 The judges display their gravitas. Customers take the chickens away. Dante, also known as Raphael by his hens, and who answers to neither name, is the sole rooster in charge of 40 laying hens. He is a Sulmthaler, and must weigh 12 lbs. He is a good rooster, and takes his job seriously. 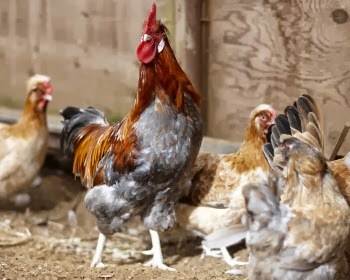 Whenever a dispute breaks out between 2 hens, which is often, especially with Plymouth Barred Rocks, Dante rushes from whatever far corner of the fenced area he occupies to get between the battling hens. He finds the highest perch he can, usually in a fruit tree in the yard, to oversee his domain. His crow is loud and clear, leaving no doubt that he is in charge. One day a few months ago, before the unfortunate incident with Pico the hen, the young goshawk had the audacity to attack one of the hens. Now these hens are large birds, easily weighing 8 lbs, and the hawk could not have been more than half that size. But still he rocketed down from a nearby perch and landed on the back of the Barred Rock. Dante instantly came running like a giant orange ball of fury, and shoved the hawk off the hen. The hawk, feathers obviously ruffled, flew back to his perch, before swooping down on Dante when his back was turned. The hawk clawed all the feathers from poor Dante's back, but was no match for the giant rooster. Dante upturned the predator, and chased him from the yard. That was almost Dante's final effort though, for he was so weak he could walk only by using his wings as crutches. With all the strength left in him, he made it to the coop door and safety, his back bleeding profusely. As proud as he was, when I detached the automatic waterer and put it in front of him, he drank gratefully. The hens, being hens and not knowing any better, began pecking at the red blood and would have finished the hawk's job unknowingly if I had not put a plaster of coal tar all over his back. Days later, Dante could barely get around. Instead of roosting high overhead in the coop with a few of his favorite hens, he stayed alone on the floor, his head pressed into a corner out of shame. In the following video, taken a few days after the attack, he still is so weak he slumps to the floor to eat his grain. Crowing is out of the question, as is flying or even climbing up to a roost. Now, a month later, Dante is back on top, crowing, perching from on high, and warning of danger as he has always done. Well done, Dante the Warrior! In every goat herd, there is one alpha female called the queen goat. Even though Rosie only has a herd of one, her rather dufus brother Nico, still she takes her job seriously. She is fussy with her food, checking out this plant and that to see if it is safe to eat. She wanders the pen looking for ways to get out, eager to show her brother the new path. She makes sure the herd is together, and that includes me. Some weeks ago, Rosie showed us what a good mother she might be if given the chance. I was moving a small flock of adolescent Sulmthaler chicks, which were living in the same building as the goats, when one small hen flew straight up and out of the pen. It was so quick I tried in vain to catch it. As I chased it, the chick found a way out so small I couldn't follow. I tried to lure it back in the next few days, but it was so skittish she would run back to her little hole when she saw me coming. Days went by and I didn't see her, and the food I left was untouched. I was sure an owl or a raccoon had gotten her, until one morning I went to feed the goats, and there was the tiny hen, perched on Rosie's head. The little bird felt safe there, and figured out how to get some of the grain from Rosie's feeder. As the weeks passed, the hen, who we called Pico, was inseparable from her "mom". When we took the goats for a walk, Pico would cry and cry to see Rosie leave. This went one for about a month, and Pico had grown from a small chick into a healthy adolescent. She traveled everywhere on Rosie or Nico's back. This did not go unnoticed by a young goshawk who had been terrorizing the layers and other hens around the farm. Normally we do not see goshawks here, as their habitat is usually north, but occasionally one will join the ravens and eagles that give an interested flyby when they hear the sound of young chickens. One day, while I was inside working, the hawk swooped low and snatched Pico right off of Rosie's back. Rosie froze as she heard her little friend crying through the trees, then silence. That was almost a month ago, and still Rosie seems traumatized. She is hesitant to leave her pen, and for the longest time looked in vain for Pico, with a caring and bewildered look in her soft eyes. I was raised in rural Everett, and also France from the years 10 to 14. I graduated from WWU in 1972, in Political Science, heading toward Law School at OSU. Instead I bought a fishing boat and have fished commercially all my life. Judy and I started Nettles Farm in 1992, producing fresh pasta and ravioli growing vegetables, eggs, and meat chickens for stores and restaurants throughout Puget Sound. We had our own USDA on-farm slaughterhouse for chickens for 4 years, producing slow growing chickens that rivaled Label Rouge chickens in France. Judy and I bought the Willows Inn on Lummi Island in March, 2001, wanting to complete the circle of our farm food to the restaurant plate.